Overkill is one of several thrash metal legends that have returned in full strength to somehow reanimate the genre over the past few years. After the mean Ironbound and the surprisingly young and fresh sounding The Electric Age, the powerful White Devil Armory completes a trio of energizing albums with a pitiless mixture of fast thrash metal, moving grooves, and a raw dose of heavy metal and hard rock. All three albums are equally great, and it’s really a matter of tiny nuance and personal taste whether you prefer this output or one of its strong predecessors. Before I go into detail, let me suggest (as usual) that you purchase the limited edition of this new record, as both bonus tracks are really worth it. The two extra songs are actually amongst my three favorite tracks here. “The Fight Song” is a passionate punk rock anthem that stands out with both energy and great rebellious lyrics, making the final result feel very authentic. If it was up to me, Overkill would release an entire punk rock album with killer songs like “Old School” or this one. The other bonus song is “Miss Misery”, which is a Nazareth cover. Almost forty years after the release of the charming hard rock classic, Overkill transform it into an authentic and timeless heavy metal anthem that closes the record on a high note. It’s one of the rare times that a band manages to improve an already excellent and familiar track, and infuse its own signature sound into the song. The cool lyrics about a femme fatale are partially performed by Mark Tornillo from the German heavy metal legends Accept, and he harmonizes very well with regular singer Bobby “Blitz” Ellsworth. Both powerful singers are obviously influenced by Nazareth, have very similar voices, and complement each other perfectly. If Overkill’s covers continue to be this worthy, I would welcome more. 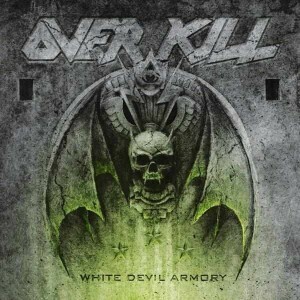 Don’t worry though, the rest of White Devil Armory is very strong, and has more to do with Overkill’s thrash metal roots. “In The Name” is my favorite song here, turning out to be a passionate old school thrash metal outburst boasting mean lyrics against the system and an anthemic and epic closure that ends the standard full-length record on the highest note. Other highlights include the pitiless album opener “Armorist”, which rips heads off and opens the demonstration with a musical molotov cocktail instead of a simple brick. “Down To The Bone” grooves a little bit more and features one of the most passionate and catchiest choruses on the entire record. This is not only a good single candidate, but also a must for live shows. “Bitter Pill” is even more engaging and grooving, and makes your limbs shake in the strangest ways. Attention: this song will make you look stupid on public transit. Caution is advised. The record also includes a couple of solid but exchangeable thrash and groove tracks that you can find on almost any Overkill album. This isn’t necessarily a negative element, but it explains why I find this album to be extremely good to excellent and not a milestone of its genre. If American bands know how to excel in one particular genre, it has to be thrash metal. Overkill strikes hard for the third time in a row, and compensates for the weaker outputs from its more famous colleagues in the Big 4 (except for Anthrax, which has come back to strength since the return of Joey Belladonna). These veterans, as well as many promising young American bands, are promising a bright future for thrash after some rough years. If you enjoy thrash, this release is a very solid candidate for the best record of its kind for the year. Let yourself go and have some fun with this authentic piece of the action, and please try not to smash your furniture or drive your car over any pedestrians while you’re experiencing this nuclear bomb of a record.